Back in 1990, nine companies with an electro-technical and building management background founded the association with the same name. Until today, worldwide more than 300 companies from 34 countries have joined this association, offering more than 7000 certified products. KNX offers wired (Twisted Pair, Powerline, IP/Ethernet) as well as wireless communication (Radio Frequency). The high interest in China for compatible KNX products and the KNX Technology has encouraged KNX Association to have the international ISO/IEC approved Standard 14543-3 translated into Chinese. The translated KNX Standard was fed into the Chinese standardization process via the standardization body SAC TC124 and approved by this committee as GB/T 20965, making KNX the only approved standard for Home and Building Control in China. China will be one of the most prominent markets for intelligent building control in the coming years. 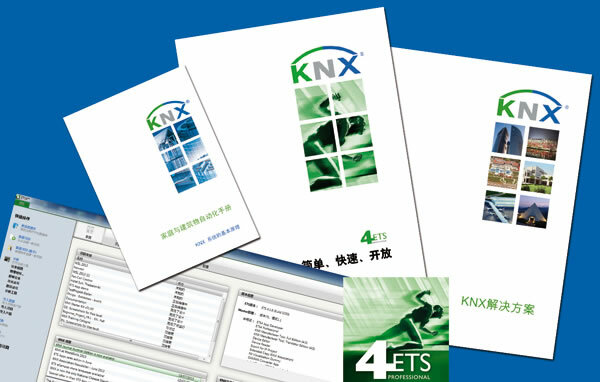 - The KNX Handbook in Chinese offers a good introduction into the KNX technology. There is a high need to drastically reduced energy consumption in China. Especially in commercial projects, one is on the look-out for adequate solutions, an ideal breeding ground for KNX products and systems. - “KNX Development Getting Started” focused on the important target group of manufacturers, wishing to develop KNX compatible devices.